Caroline Creaghead's vision for an accessible, open sourced recording and streaming platform became a reality after being awarded one of 2017's Globe Grants from People's Liberty. The public radio station invites people of any experience level or background to create and stream audio content locally, and provides the gear, know-how and access to a web platform on which to be heard. 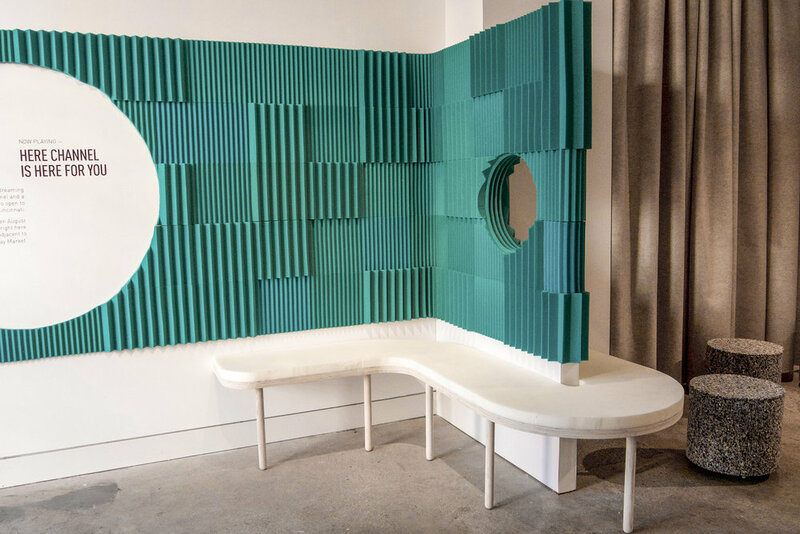 The project draws influence from traditional recording studios, utilizing functional, budget conscious materials like acoustic foam, to create distinct spaces. The lounge, reception area and recording booth are defined by graphic forms and color breaks, while felt curtains on curved track isolate a multi-functional event space in the rear of the room. Bold, playful textures come together to stimulate interest, and unobstructed visibility into the space showcases activities within, inviting participation. Designed by Team-B Architecture and Design. Fabricated and Installed by Sediment Design Co.